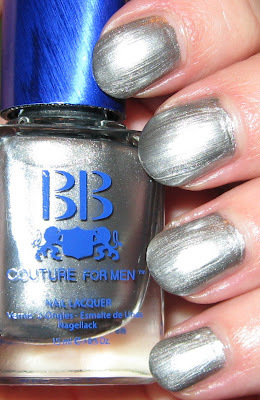 Above: BB Couture's Caliber is a bright silver with a chrome/foil finish. I apologize for the glare, but we're trapped in the the house today because of a blizzard, so a flash was the only option. 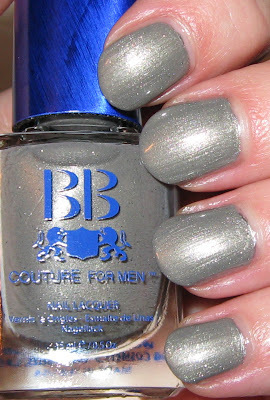 Below: Widow Maker, a light grey shimmer, is a very nice shade. It's my favorite out of these 3 because of the finish type. Below: Blue Steel, despite it's name, does not show a trace of blue to me! It's a dark Charcoal grey with a chrome/foil finish. All 3 covered nicely in 2 coats. 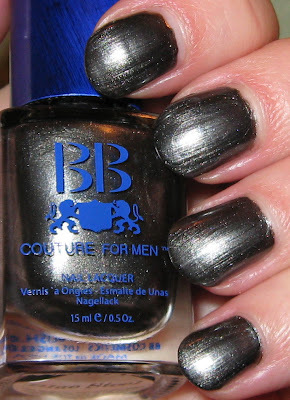 These 3 shades are all from BB Couture's men's polish line and were released a few months back. Their latest men's releases can be found in my posts earlier this week, if you'd like to scroll down. We're having our first snow day today and it's extremely cold, windy, and of course, snowing. So I'm busy trying to keep my daughter entertained and our newest dog distracted from the cats! I have been very frustrated with the lack of sun and bitter cold temperatures, because that means I'm forced to shoot only indoor photos, which always have lighting issues. I wanted to mention that Joann Fabrics has their Ott Lighting 50% off this week, which is a fabulous deal. I need to get mine out, because it definitely helps with indoor shots. Back to the polishes...there were 3 greys in this first collection, which seems a bit much to me. I'll have the other 3 shades for you later in the day. They all covered exceptionally well in 2 coats, and dried quickly to a high shine. Caliber and Blue Steel have a chrome, and somewhat frosty finish, which I'm not fond of, but the brush strokes were minimal compared to many other brands with this finish. Widow Maker is a lighter shade, with shimmer. I would call this a Dove grey. All in all, they're nice shades, and I'd have to say that of these 3, Widow Maker would be my first choice, simply because I'm not a fan of chrome finishes. Just a reminder that Overall Beauty is offering free shipping through 12/11 on all of their orders. Those colors are great, but to me they looks really streaky. Blue Steel is my faovrite of these. I have this first mens collection. I haven't worn any yet. I wish blue steel had a flash of blue in it. Widow Maker is my favorite also. All that snow, glad it's you and not me! I'm always cold and I don't want any snow.